Sharing your life with a cat is a wonderful and fulfilling experience. Sharing your life with an awake, alert, and bored cat in the early hours when you are trying to sleep, is not. [Simon Aubury] has just this problem, as his cat [Snowy] is woken each morning by a jet passing over. In an attempt to identify the offending aircraft, he’s taken a Raspberry Pi and a software-defined radio, and attempted to isolate it by spotting its ADS-B beacon. The SDR was the ubiquitous RTL chipset model, and it provided a continuous stream of aircraft data. To process this data he used an Apache Kafka stream processing server into which he also retrieved aircraft identifying data from an online service. Kafka’s SQL interface for interrogating multiple streams allowed him to untangle the mess of ADS-B returns and generate a meaningful feed of aircraft. This in turn was piped into an elasticsearch search engine database, upon which he built a Kibana visualisation. The result was that any aircraft could be identified at a glance, and potential noise hotspots forecast. Whether all this heavy lifting was worth the end result is for you to decide, however it does provide an interesting introduction to the technologies and software involved. It is however possible to monitor ADS-B traffic considerably more simply. Thanks [Oleg Anashkin] for the tip. With the advent of low-cost software defined radio (SDR), anyone who’s interested can surf the airwaves from the FM band all the way up to the gigahertz frequencies used by geosynchronous satellites for about $20 USD. It’s difficult to overstate the impact this has had on the world of radio hacking. It used to be only the Wizened Ham Graybeards could command the airwaves from the front panels of their $1K+ radios, but now even those who identify as software hackers can get their foot in the door for a little more than the cost of a pizza. But as many new SDR explorers find out, having a receiver is only half the battle: you need an antenna as well. A length of wire stuck in the antenna jack of your SDR will let you pick up some low hanging fruit, but if you’re looking to extend your range or get into the higher frequencies, your antenna needs to be carefully designed and constructed. But as [Akos Czermann] shows on his blog, that doesn’t mean it has to be expensive. 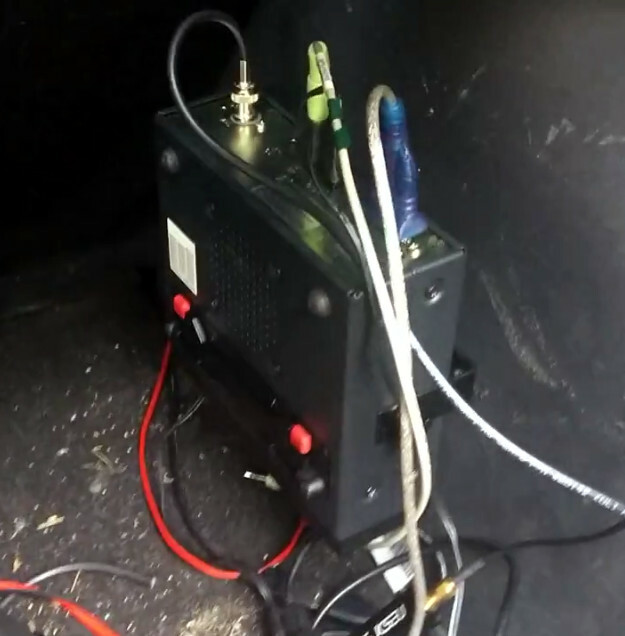 He shows how you can construct a very capable ADS-B antenna out of little more than an empty soda can and a bit of wire. 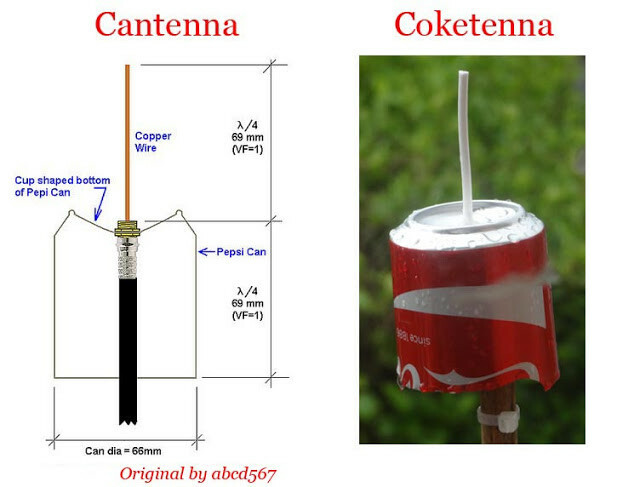 He makes it clear that the idea of using an old soda can as an antenna is not new, another radio hacker who goes by the handle [abcd567] popularized their own version of the “cantenna” some time ago. But [Akos] has made some tweaks to the design to drive the bar even lower, which he has dubbed the “coketenna”. The primary advantages of his design is that you no longer need to solder anything or even use any special connectors. In fact, you can assemble this antenna with nothing more than a pocket knife. You start by cutting the can down to around 68 mm in length, and cutting an “X” into the bottom. Then strip a piece of coax, and push it through the X. The plastic-coated center conductor of the coax should emerge through the bottom of the can, while the braided copper insulation will bunch up on the other side. If you want to make it really fancy, [Akos] suggests cutting a plastic drink bottle in half and using that as a cover to keep water out of the “coketenna”. How well does it work? He reports performance being very similar to his commercial ADS-B antenna which set him back $45 USD. Not bad for some parts of out the trash. We’ve covered the math of creating an ADS-B antenna in the past if you’d like to know more about the science of how it all works. But if you just want an easy way of picking up some signals, this “coketenna” and an RTL-SDR dongle will get you started in no time. SpaceX just concluded 2017 by launching 10 Iridium NEXT satellites. A footnote on the launch was the “hosted payload” on board each of the satellites: a small box of equipment from Aireon. They will track every aircraft around the world in real-time, something that has been technically possible but nobody claimed they could do it economically until now. Challenge one: avoid adding cost to aircraft. Instead of using expensive satcom or adding dedicated gear, Aireon listen to ADS-B equipment already installed as part of international air traffic control modernization. But since ADS-B was designed for aircraft-to-aircraft and aircraft-to-ground, Aireon had some challenges to overcome. Like the fact ADS-B antenna is commonly mounted on the belly of an aircraft blocking direct path to satellite. Challenge two: hear ADS-B everywhere and do it for less. Today we can track aircraft when they are flying over land, but out in the middle of the ocean, there are no receivers in range except possibly other aircraft. Aireon needed a lot of low-orbit satellites to ensure you are in range no matter where you are. Piggybacking on Iridium gives them coverage at a fraction of the cost of building their own satellites. Blogger [radioforeveryone] set out to look at 19 different RTL-SDR dongles for use in receiving ADS-B (that’s the system where airplanes determine their position and broadcast it). Not all of the 19 worked, but you can read the detailed review of the 14 that did. Granted, you might not want to pick up ADS-B, but the relative performance of these inexpensive devices is still interesting. The tests used Raspberry PI 3s and a consistent antenna and preamp system. Since ADS-B is frequently sent, the tests were at least 20 hours in length. The only caveat: the tests were only done two at a time, so it is not fair to directly compare total results across days.